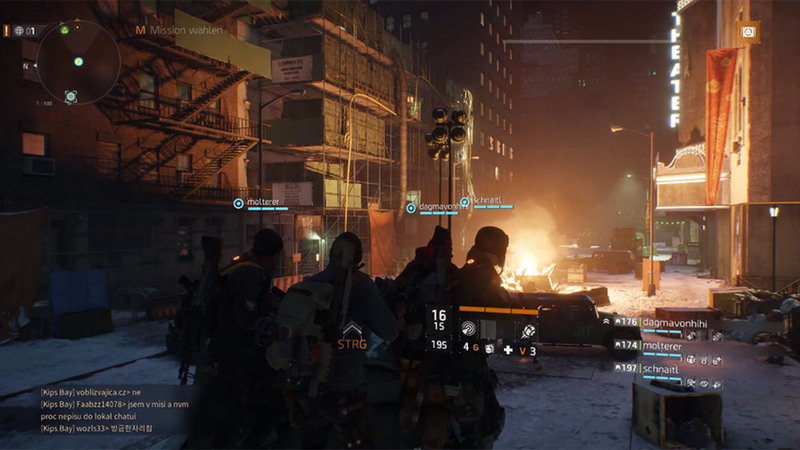 Operation Jane Walk appropriates the hallmarks of an action roleplaying game – Tom Clancy’s The Division (2016), set in a barren New York City after a smallpox pandemic – for an intricately rendered tour that digs into the city’s history through virtual visits to some notable landmarks. 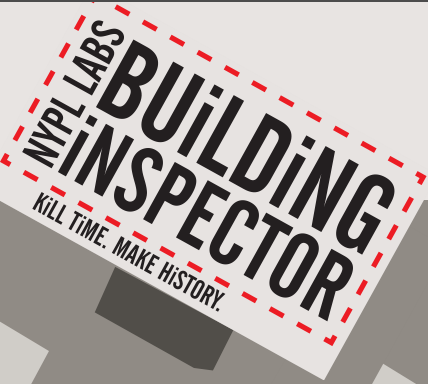 Bouncing from Stuyvesant Town to the United Nations Headquarters and down the sewers, a dry-witted tour guide makes plain how NYC was shaped by the Second World War, an evolving economy and the ideological jousting between urban theorists such as Robert Moses and Jane Jacobs. Between stops, the guide segues into musical interludes and poetic musings, but doesn’t let us forget the need to brandish a weapon for self-defence. The result is a highly imaginative film that interrogates the increasingly thin lines between real and digital worlds – but it’s also just a damn good time. Aeon has a great tour of New York using Tom Clancy’s The Division, Skip the bus: this post-apocalyptic jaunt is the only New York tour you’ll ever need. It looks like someone actually gives tours this way – a new form of urban tourism. What other cities could one do? ‎Queer places are, by definition, sites of accretion, where stories, memories, and experiences are gathered. Queer place, in particular, is reliant on ephemeral histories, personal moments and memories. GoQueer intends to integrate these personal archives with places for you to discover. I recently downloaded and started playing the iOS version of ‎GoQueer from the App Store. 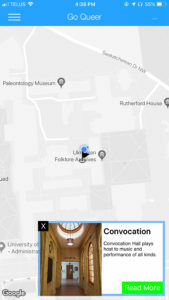 It is a locative game from my colleague Dr. Maureen Engel. Engel reflected about this project in a talk on YouTube titled Go Queer: A Ludic, Locative Media Experiment. Engel nicely theorizes her game not once, but in a doubled set of reflections show how theorizing isn’t a step in project design, but continuous thinking-through. You can also see an article reflecting on this game by the title, Perverting Play: Theorizing a Queer Game Mechanic. 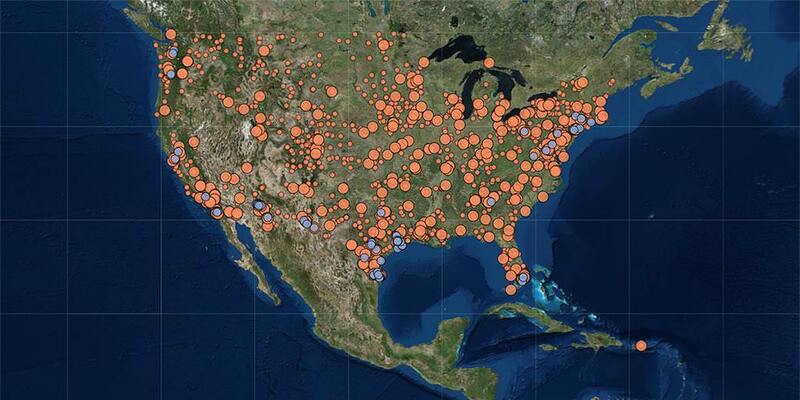 Torn Apart is a curation and visualization of publicly available data concerning ICE, CBP facilities, and usages. Also lists of allied and pro-immigrant facilities. At DH 2018 I heard Roopika Risam speak about the impressive critical digital humanities Torn Apart / Separados project she is part of. (See my conference notes here.) The project is rightly getting attention. For example, the Inside Higher Ed has a story on Digital Humanities for Social Good. This story presents Torn Apart / Separados as an answer to critiques about the digital humanities that they are not critical enough and/or lack interpretative value. (See Stanley Fish’s Stop Trying to Sell the Humanities.) The Inside Higher Ed article rightly points out that there have been socially engaged digital humanities projects for some time. What I find impressive and think is truly important is how nimble the project is. This project was imagined and implemented in “real” time – ie. it was developed in response to events unfolding in the news. It was also developed without a grant and by a distributed team of volunteers. Thats what computing in the humanities should be – a way to think through issues critically not a way to get funding. 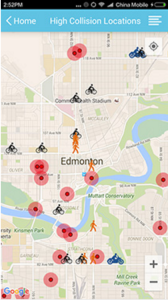 Edmonton has released a new mobile app called SmartTravel. 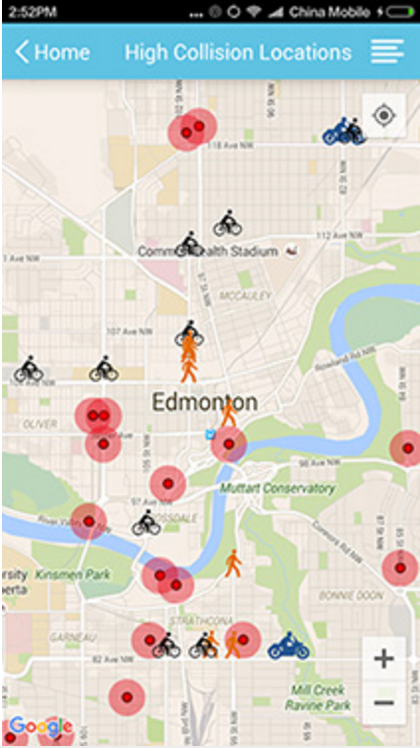 The new mobile app issues verbal safety warnings to Edmonton drivers. You can get live warnings as you drive or before. Interesting idea. Thanks to a note from Domenico Fiormonte to Humanist I came across the Information Geographies page at the Oxford Internet Institute. The OII has been producing interesting maps that show aspects of the internet. The one pictured above shows the distribution of Geographic Knowledge in Freebase. Given the importance of Freebase to Google’s Knowledge Graph it is important to understand the bias of its information to certain locations. 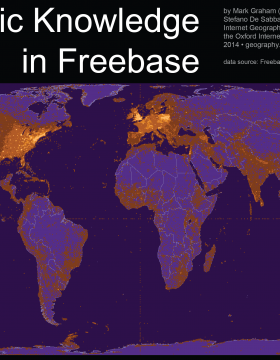 Geographic content in Freebase is largely clustered in certain regions of the world. The United States accounts for over 45% of the overall number of place names in the collection, despite covering about 2% of the Earth, less than 7% of the land surface, and less than 5% of the world population, and about 10% of Internet users. This results in a US density of one Freebase place name for every 1500 people, and far more place names referring to Massachusetts than referring to China. Domenico Fiormonte’s email to Humanist (Humanist Discussion Group, Vol. 29, No. 824) argues that “It is our responsibility to preserve cultural diversity, and even relatively small players can make a difference by building more inclusive ‘representations’.” He argues that we need to be open about the cultural and linguistic biases of the tools and databases we build.